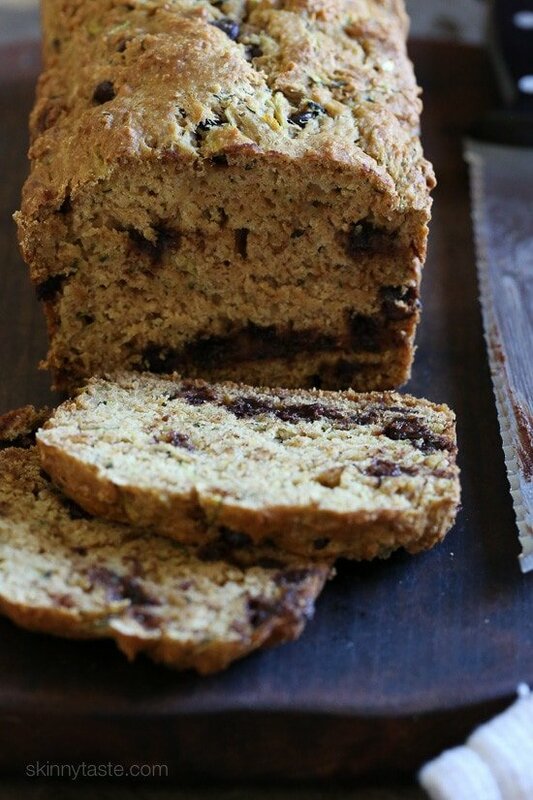 This moist Chocolate Chip Zucchini Bread is loaded with chocolate chips in every bite! You only need one bowl to make this healthy version of the classic chocolate zucchini bread made with a whole wheat flour blend & apple sauce in place of butter. 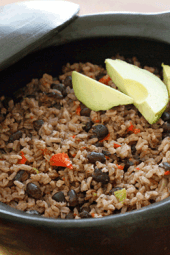 An easy and delicious recipe without a ton of fat. Madison was one when I first played around with this and loved it then, but I wasn’t sure how she would feel seeing small green specs (she doesn’t like zucchini) in her bread now that she’s five, but she loved it! Give this a try, I’m sure you’ll agree, and bonus, a perfect way to get your kids to eat zucchini. And yes, you can also make these as muffins although the cooking time will be less. 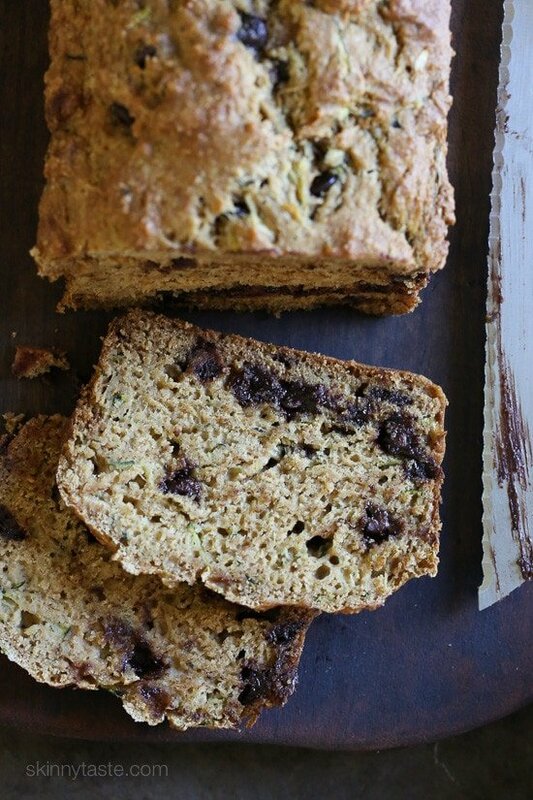 This super moist Chocolate Chip Zucchini Bread is loaded with chocolate chips in every bite. Made healthier with a whole wheat flour blend and lots of apple sauce in place of butter for results that are moist and delicious, without a ton of fat. Preheat oven to 325°F. Spray a 9×5-inch loaf pan with cooking spray. In a medium bowl, mix egg, vanilla, melted butter, apple sauce and zucchini. Add to the flour mixture and stir until just blended. Pour batter into the prepared 9×5-inch loaf pan. Bake 45-55 minutes, or until a toothpick inserted in the center comes out clean. Cool for about 10 minutes. Remove loaf from pan and let it cool before slicing. Help! What can I replace the apple sauce with ? How many points would it be for mini muffins? I LOVE all the recipes I’ve tried so far (in your cookbooks and online). Thanks for the hard work you put into the recipes. Made this bread today for our dinner. Had frozen zucchini. Drained in strainer and it worked fine. Used sugar free chocolate chips and a few cinnamon models too.. Had to turn heat up to 350 though. Thanks for a wonderful recipe. Do you know if you can use regular sugar instead of brown sugar? First of all, there isn’t a Skinnytaste recipe that hasn’t been amazing and I’ve been following for years :)I love this recipe and I’ve made it so many times — today I did something I NEVER do and I actually didn’t follow the recipe exactly as written and changed something! lol.The only reason I did this was because, growing up, my mom made zucchini bread from the Betty Crocker cookbook that was so addictive I wanted to eat the whole loaf. I used to make it all the time too, but it did have oil in it. So the only thing I did with this amazing recipe was add 1 tsp of cinnamon and 1/2 tsp of cloves because I think that’s what it was about the Betty Crocker recipe that I loved so much. It tastes really great! !Thank you for being the best go-to for delicious, healthy food! I tried this bread and have now made it 3 times! It is totally delicious. I have used unsweetened apple sauce, and mashed banana and used both in one of the batches. I added a little extra vanilla and a dash of cinnamon just for fun. I found that with the banana it cooks for a long time, so I ended up doing it in cupcake tins the last time. They came out great! Took them to work and everybody wanted the recipe. Thank you so much! My husband and I love this bread. Today I made it with blueberries rather than chocolate and it is still wonderful, I also use the brown sugar Splenda blend to reduce calories and sugar load ( only 1/4 to 1/3 cup) and add a bit on cinnamon as well.. Great by itself and with some fresh made berry spread or jam and old fashioned peanut butter. For the butter, is it two tablespoons of butter that you melt or two tablespoons of melted butter? Amazing! My whole family loved this bread and it was quick and easy to make. Delicious recipe. I made a few changes:- used only AP flour as I did not have any whole wheat flour at home right now- subbed olive oil for the melted butter – omitted the chocolate chips- added cinnamon and cardamom- baked into four JUMBO muffins (for 30-35 minutes)Four jumbo muffins with the above adjustments yielded a 13 Freestyle point muffin. Definitely a keeper. Not too sweet, just perfect for breakfast. Can you make these as a muffin and also add ripe bananas to the mix? How long would it be for regular muffins? So good! I was really skeptical of this one. As I was making it, I was thinking, “There’s always more sugar and fat in good quickbreads. This isn’t going to taste very good!” BUT IT DOES. I don’t miss the extra sugar or fat at all. I made this into muffins and baked for about 30 minutes. I also used all white whole wheat flour and it was still good. P.S. This was the FIFTH zucchini recipe I made this weekend, because I’m faced with six enormous zucchinis from my neighbor’s garden. All of them were from your website and all were delicious. My garden is bursting with zucchini and this recipe was a wonderful and delicious way to make good use of it. I made a couple batch and it was delicious! 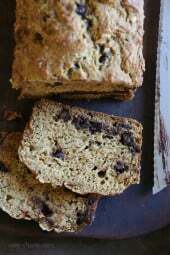 I made a double batch , did half a cup of chocolate chips and half a cup of walnuts, my boys had a loaf gone that day! Another winner Gina! I only had 1/2 a cup of whole wheat flour so I used an extra 1/2 cup of all purpose flour. Turned out awesome, everyone loved it! Hey, I made this today with two cups of gluten-free flour. I followed another commenter’s advice about adding an extra egg & baking powder. It’s yummy, but it never formed up & seems a little undercooked. The top is brown, though. I assumed it’s just the nature of GF flour. Any advice? Could you do this with berries? Also how would 1 more egg affect how it turns out? Maybe a dumb question but what type of chocolate chips? Semi sweet, dark or milk? Pingback: Banana Zucchini Cake with Cream Cheese Frosting - What's news today? Is it necessary to drain the zucchini after shredding? Mine is in the oven now and I would say definitely do not drain. The moisture is needed, otherwise the batter will be too dry. I made this for this first time last night and ohhh myyyy gaaahhddd. SO. GOOD. Thank you introducing this recipe into my life! So healthy and satisfying. I will be convincing all my family and friends to make it! It’s zucchini season here! I just made this last night, as muffins, with the plethora of zucchini that I have on my counter. Absolutely delicious! Thank you, Gina! Another winner – so moist and delicious. I will definitely make this one again! 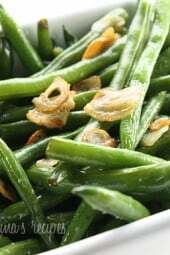 a staple– sweet enough to feel like a treat but so much healthier than similar options. What would the weight be on 1/2 cup brown sugar and 1 & 1/2 cup zucchini since I am unsure of what loosly packed should be. Thanks for your help! I just recently found you. Very excited about your recipes. I also just baked this. It tastes wonderful. My 15 year old son even liked it! When I was making the batter, he walked by and asked if I was making cookies….excellent sign he would taste test afterwards. He ate half the first loaf (he’s a wrestler, lol), so I made a second. Thank you!!! Welcome to Skinnytaste! Glad you enjoyed your first recipe! Have made this several times as muffins, and it’s fantastic. Can you substitute canned pumpkin for the applesauce? Do you squeeze the liquid from the shredded zucchini before mixing? So good, Gima! I used two overripe bananas instead of applesauce. Turned out perfectly. Even my kids loved it? What are the smart points values as muffins? It lists old point and points plus. Thanks! Let me check into it! We belong to a CSA and have a glut of zucchini. I was skeptical of baking with applesauce. This recipe was amazing! I baked it as muffins (about 20 minutes) and used all purpose and whole wheat flour. The only change was I added a tsp. of Penzey Pie Spice. The muffins were moist and tender! Thank you Gina! We love this recipe. 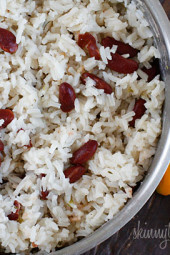 It has become a weekly staple in our home! Thank you! This bread is delicious! Not very sweet on its own,, but the chocolate chips sweeten up every bite perfectly (and help save on the overall sugar content)! I made my batter in the Vitamix – blending the zucchini roughly chopped with applesauce, then adding other wet ingredients and finally the dry. It was so easy and turned out just as delicious. Used 1 whole zucchini which seemed perfect! I made this yesterday into muffins but they were not sweet. My applesauce was unsweetened should it have been sweet? The muffins were moist but not sweet. Not sure if I will make this again. You could probably add honey to make it sweeter. Just made this and it came out great! Used GF flour, an extra egg and and added 1/8 of baking powder to compensate for the different flour. Rose beautifully. Thank you, Gina, you are my go-to for recipes! Leigh! I’m looking to make this today with GF flour, as well. Did you use 1 cup or 2 cups? TIA! Did you use the correct amount of zucchini? Help! My applesauce is moldy. CAN I use greek yogurt instead? we use all Whole Wheat Flour, add a tsp Cinnamon and a scoop of Flax Seeds. Loved by all! and I make like 10 and freeze them for all winter long! I LOVED this one! Made a batch in early August and they freeze beautifully. Making another batch tonight. Thanks for another great recipe! 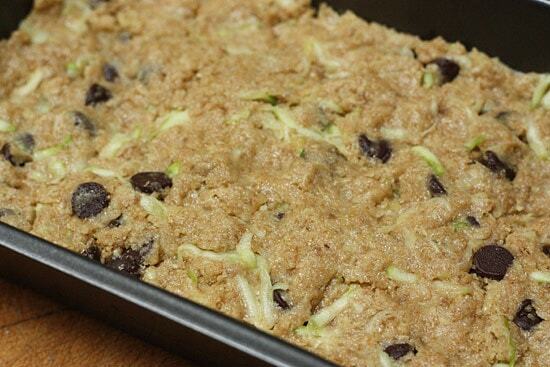 Terrific zucchini bread!! Much much better than the chocolate zucchini bread I made that called for a half cup of oil. I don’t know why but your bread had the most fantastic vanilla-y smell when baking. Can I use carrots and apple in this recipe. And 1 cup whole wheat flour? Would i be able to make this with just zucchini and no choc chips? 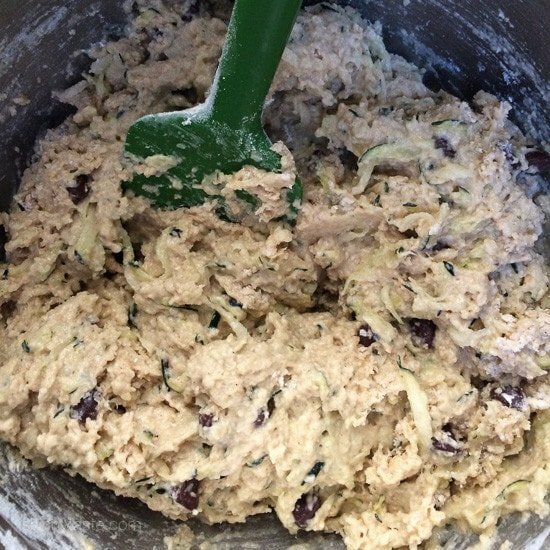 Like in place of the chocolate chips use 1/2 zucchini instead? I was wondering the same for a less points options so I did the work and 1/2 cup semisweet chips is 21 points. Divide that by 16 portions which the recipe makes and you can subtract 1.3 points per serving to make it 4ish points per serving. There should be no need to substitute more zucchini in place of absent chocolate chips. I tried raisins and it was really good! The extra sweetness was perfect. I’d try around 25 min.